Note: an additional $0.35 each lanyard for Pattern # P11, P18, & P19 will be added automatically. 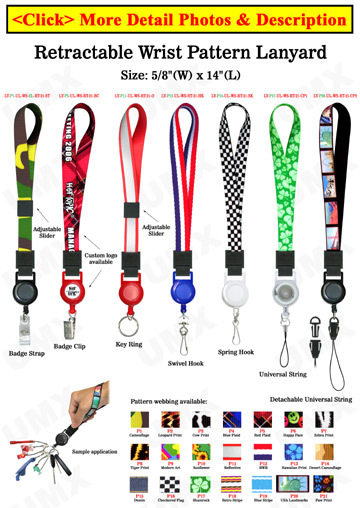 The LY-P-UL-WS-RT-21, preprinted wrist lanyard comes with a retractable reel and your choice of hardware attachment for your specific needs. The retractable itself comes in a variety of colors with a choice of 7 different hardware attachments. We carry a large selection of art-patterned lanyard straps to suit your fashion style.